Medico is proud to announce that our Los Angeles Plant has earned the Hygienically Clean Healthcare certification from the TRSA. Now, both of our facilities are Hygienically Clean Healthcare certified. This certificate ensures that our laundry process meets the highest standards for healthcare textile processing in the industry. Many medical laundry providers do not take these rigorous steps to ensure their facilities are certified Hygienically Clean, largely because it requires both significant investment and action. The bottom line is that Medico values patient safety and this is what drives us to always do more than what is required. In order to earn this certificate, our laundry passed three rounds of microbial testing to demonstrate that our products are free of yeast, mold and harmful bacteria. Our facilities also were subjected to a thorough inspection. This certificate proves that Medico only uses laundering processes, chemicals and best management practices that have been approved by the Centers for Disease Control, the American National Standards Institute and other important regulating bodies. What does this mean for my medical facility? 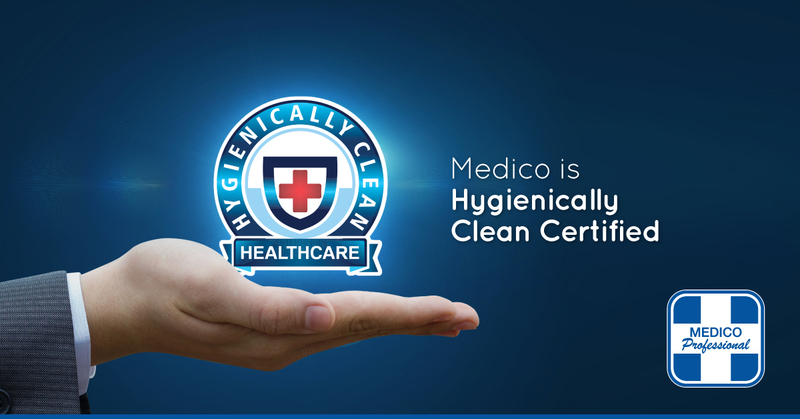 Our Hygienically Clean Healthcare certification is just further confirmation that you can trust Medico Professional Linen Service with all your medical textile needs. We have processes in place that are designed to reduce the risk of cross-contamination while also maintaining the softness and structural integrity of your medical uniforms, bed linens and bath linens.